This is a simple application where in you think of a number from 1-99 in your mind and then the machine tells you what it is ! All you have to do is, think of a number and say if it is greyed out in the series of cards shown. Number 2 4 – This in BCD would be 0010 0100. Thus this number would be found in sheet3 and sheet6. When you press these corresponding switches, the number would come up in the 7-segment display. The switches used here are momentary push switches. When the switches are pressed, we would need it to be giving a constant HIGH. For this we use D Flip Flop (IC4013). The flip flop is used to sense the switch input and it goes high permanently (until the reset button is pressed). For this we connect the ‘data’ pin to VCC and the clock pin to the switch output. As the flip flop is positive edge triggered, this pin is pulled low with a resister and the switch is connected to VCC. When the switch is pressed, the pin is pulled up to VCC and this triggers the flip flop, thus the output pin ‘Q’ goes HIGH. IC7447 is used to drive the 7Segment. 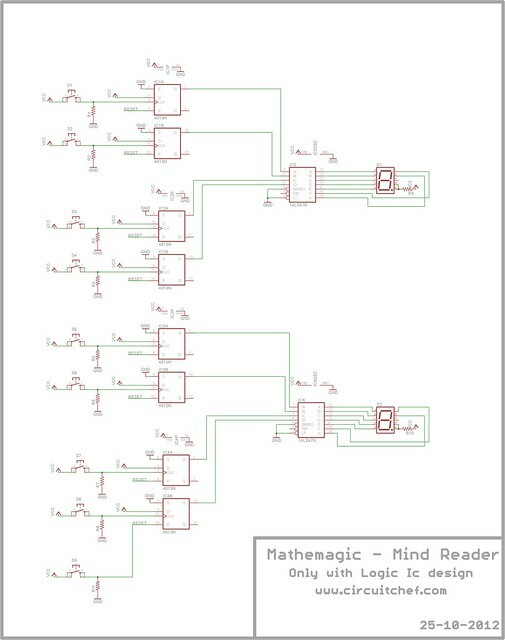 This circuit uses a common anode 7-Segment, the output of flip flops are directly fed to the BCD inputs of the 7segment driver. This entry was posted on Thursday, October 25th, 2012 at 5:44 pm and is filed under electronics. You can follow any responses to this entry through the RSS 2.0 feed. You can leave a response, or trackback from your own site. How much volts do you use to power these? And also, can we use CD3013BE instead? And what values of resistor do you use? What are the values of volt you use? And what are the values of resistor? I go to see each day a few websites and blogs to read posts, however this blog presents feature based articles.